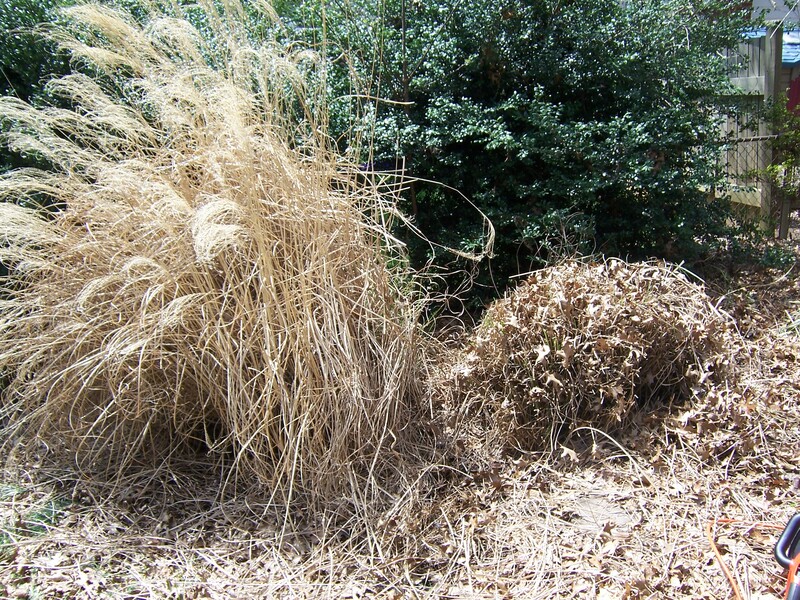 Ornamental Garden – the purging has begun. Of necessity, my decorative gardening work went a lot slower than putting in the annual vegetable patch. 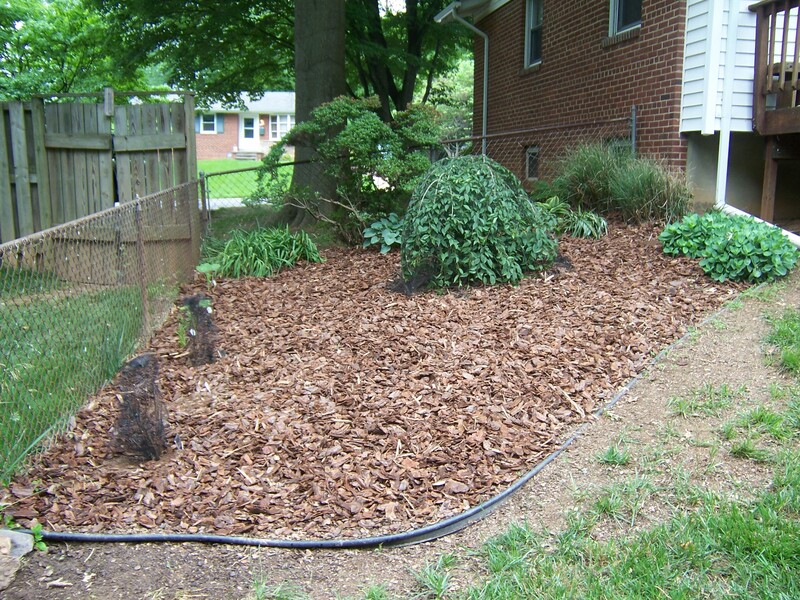 As I mentioned in my previous blog post, my husband and I pulled out pretty much everything in my ornamental garden, a fan-shaped plot about fifteen feet across and nearly as deep. Some years ago I made the error of planting a trumpet vine in the garden. I had a clematis growing up a cheap metal arch in the middle of the garden, but the clematis never did that well and I decided to start the trumpet vine up the other side of the arch. Well, the trumpet vine liked where it was so well that it grew and grew and got heavier and heavier until it was almost too much weight for the arch. A windstorm blew it over one day; we managed to jimmy the thing back up but knew it was a matter of time before everything came crashing down. Hurricane Irene in 2011 delivered the coup de grâce. We were out of town due to a family death and came home to the sight of the whole arch crumpled across the garden. I should have pulled everything out then and there, but I didn’t, and the vine kept growing and growing, until it, along with two big patches of sawgrass and a pair of scruffy bushes (species unknown), had pretty much taken over the garden. 2012 flew by and I was too busy/uninspired/lazy to deal with it, but in early spring of this year I had a happy confluence of good weather, unemployment and fresh determination, and started pulling the ornamental garden apart. One haircut down, one to go. I wish I’d taken some photos before I actually began yanking out stuff, but the photo above will give you an idea of the mess. What you’re seeing is mostly the sawgrass and the bushes; I had already pulled out the trumpet vine and the remnants of the metal arch (so rusted that I could snap it apart with my bare hands). Some of the vine is piled in the foreground. I knew I wanted to move the sawgrass to the side of the garden nearest the house, but first they had to get their spring haircuts so they’d be manageable. Then I’d have to dig both plants up – a daunting prospect. Sawgrass plants don’t strike deep roots, but the rooting is thatchy and stubborn, and my plants are quite large. To your left is a photo of the sawgrass plants – one pre-haircut, one post. I used my electric hedge-trimmer for the buzzcuts. Once the sawgrass were trimmed, I dug them up using a combination of spade and mattock. Yes, boys and girls, I had to chop them out. Once the largest one was uprooted, I actually had to sit down and lever it out of the ground with my feet – it was that massive. Out of the ground, the plants were hard to move; I was able to drag the smaller one (by the short hairs, so to speak) but the larger one had to be turned on its side and rolled, like a barrel. About the only thing left in the garden at this point were a liriope plant, some daylilies, a bunch of dependable sedum, a bleeding heart (which had already bloomed in spectacular fashion), the two nondescript bushes and an azalea, which had not enjoyed being overwhelmed by the fallen trumpet vine and looked pretty scraggly. The nondescripts, on the other hand, looked positively robust. 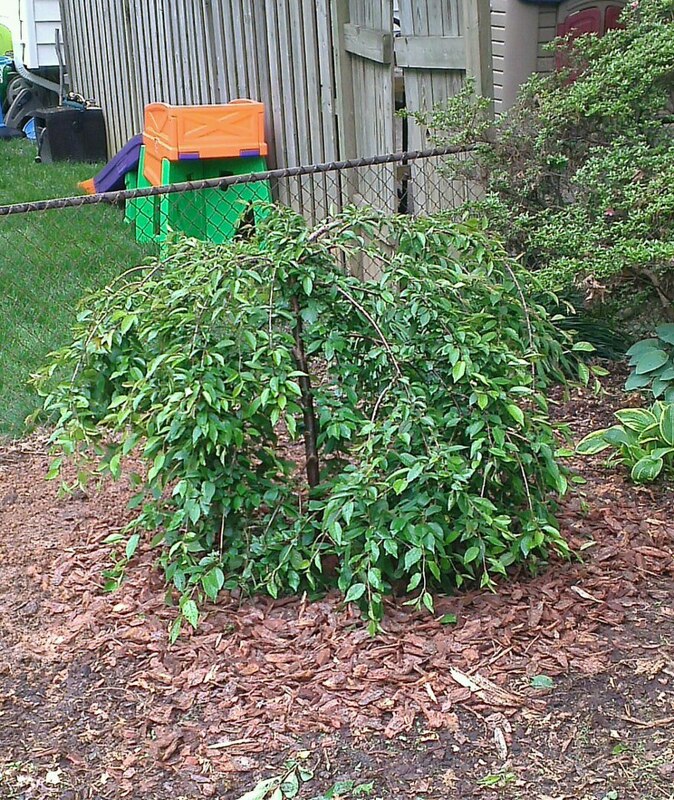 John has always hated those bushes and we could never agree on how they should be pruned, so when he asked if we could remove them entirely, I saw yes. I bundled and bagged while he chopped, and we had them out in no time. 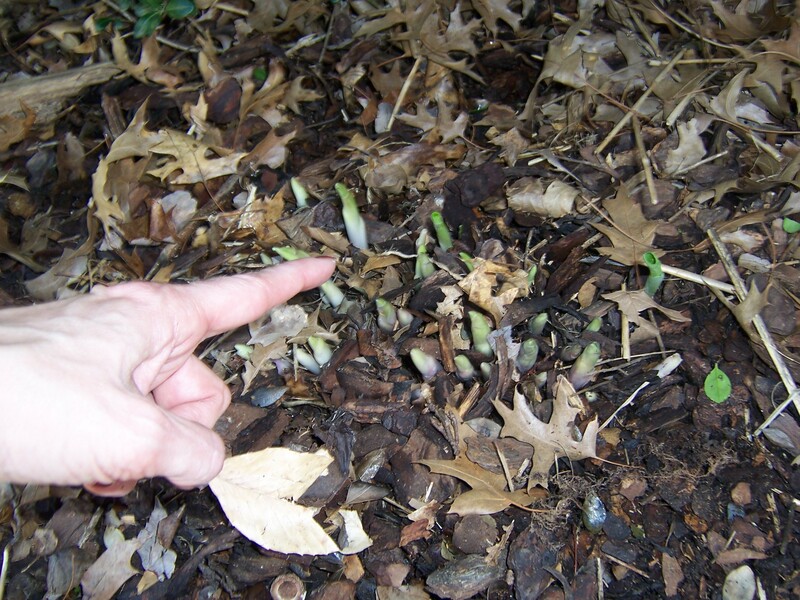 Then we raked all the rubbish out and discovered that the hosta I was certain had been killed by neglect were, in fact, still alive and beginning to push through the soil. I knew I’d have to move them, but I wanted them pop through a little more before I did. About this time my mother informed me that she was sending me a birthday gift of plants, so I was able to begin planning the garden’s layout. With the nondescript bushes removed, I had a lot more space to deal with. 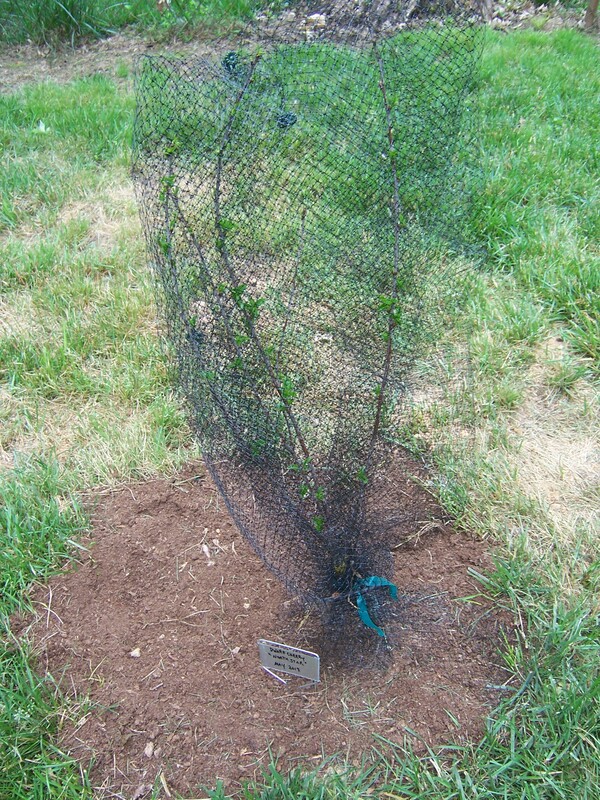 I knew I wanted some kind of small tree in the center of the garden and toyed with the idea of a fig tree, but eventually John and I decided to buy ourselves a 20th anniversary tree, in the form of a dwarf Japanese weeping cherry. 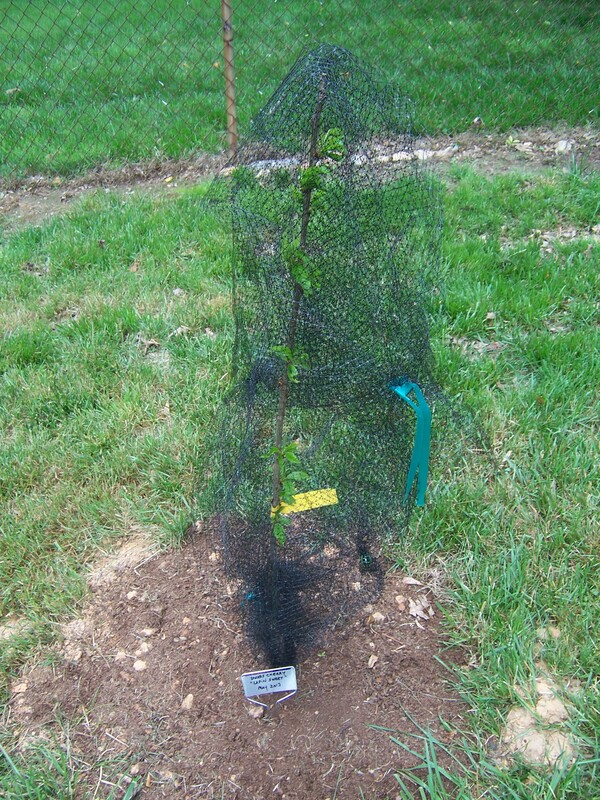 We bought a pretty one at our local nursery and planted it carefully, then netted it against the ominous warnings about Brood II cicadas and the damage they can do to young trees. I still wanted a fig three, though, and the ornamental cherry reminded John of the cherry tree he had planted in his family’s yard long ago (and which is still going strong as of this writing). We decided we wanted those, too, although they would get places in the yard rather than in the garden. 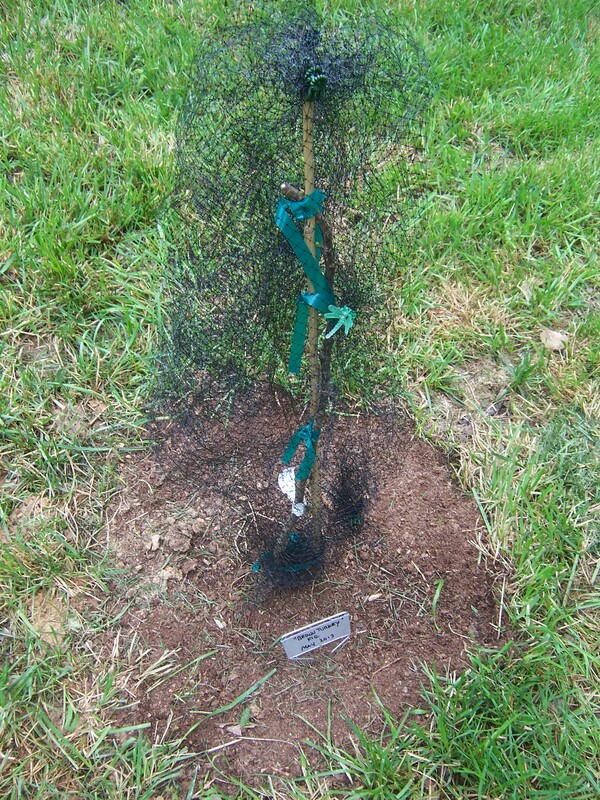 The bare-root saplings arrived quickly and were planted and netted posthaste. So here they are – our four little trees. I realize some of them hardly look like trees at all – more like sticks covered with black cotton candy – but all of them are budding and leafing and showing every sign that they’re trying to get established. I am praying that the Brood II cicadas (which have yet to appear in our area – thank you, long cool spring) will leave them alone, but I know we’ll have to be vigilant. The gifts from my mother arrived in dribs and drabs – in fact, I’m still awaiting a shipment of crocosmia – but I ended up with doubles of some plants, so I guess I can’t complain. Instead of a single hydrangea, I got two – a pair of Snow Queen Oakleaf Hydrangeas. This entailed a certain amount of replanning in the ornamental garden, which entailed having to shift the liriope yet again – the poor thing had already been moved twice and wasn’t happy about it. I got everything planted and the garden finally has a shape to it, although because so many of the new plants are quite young and small, it looks rather empty at the moment. I’m sure with time and care, everything will expand to fill its place. Yesterday we weeded yet again and then laid down some mulch, and I’m giving some thought to how I want to fill in the gaps until everything gets established. Until then, it’s weed, feed, water and watch – and cross fingers that the cicadas won’t be as awful as everyone predicts. The rebirth of the ornamental garden. 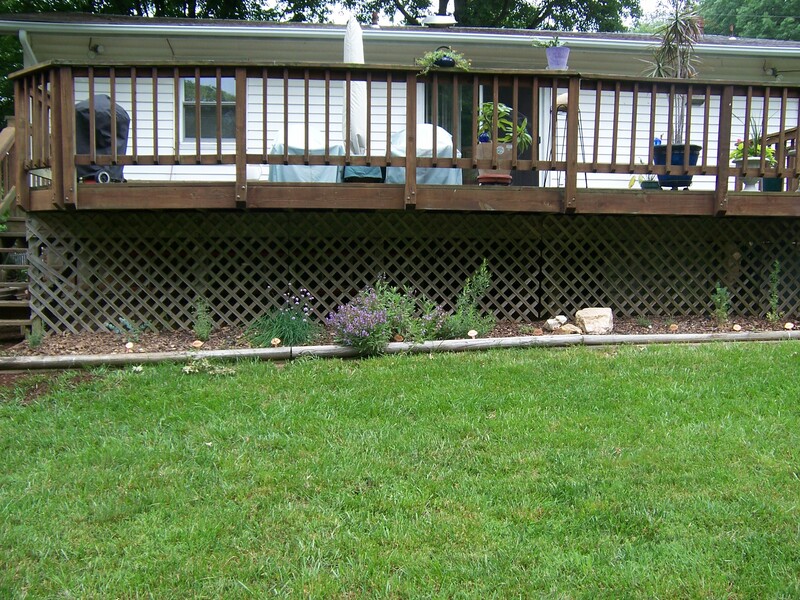 Bonus photo: herb garden and some of the potted stuff on the deck. The rocks in the herb garden are being eyeballed as part of a potential rock garden.